Dash-Cam With a Tattle Tale Button! 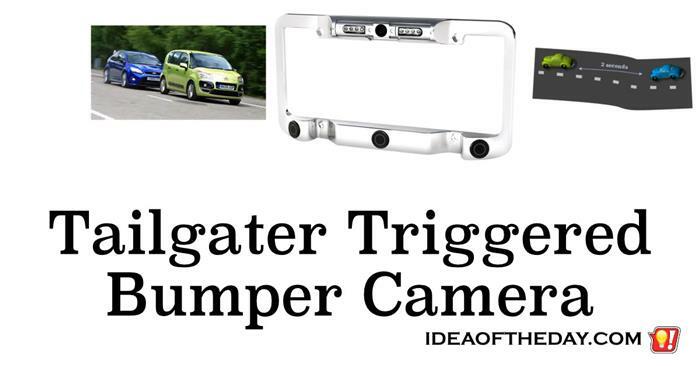 Wouldn't it be great if you could hit a button on your dash-cam whenever you see somebody doing something unsafe? There are a lot of unsafe drivers out there. Whenever I see somebody doing something unsafe, the first thing that comes to my mind is hoping a police officer saw it too. That's where today's idea of the day comes from. Rearview bumper cameras are a great idea. Here's how to make them better. I love the rear view bumper camera on my new truck, but it's a shame it's only turned on whenever I'm backing up. This made me think about other uses for it. For example, why not use the camera to make full-time recordings of whatever's behind you... in case you need evidence after somebody hits you from behind? This would be super easy for car makers to implement. All they need to do is keep the camera on the entire time, and continuously record whatever is behind you on an endless loop. In the event of an impact, the recordings would be frozen, so they aren't automatically erased. Most of today's cars have USB ports. They just need better locations. Since most of the devices people use are placed ABOVE the dashboard, why are most of the USB ports located at the bottom of the dash? That means the wires end up dangling across the dash. What car makers need to do is add some additional ports above the dash, such as above the windshield of behind the rear view mirror. Why do so many people risk their lives changing tires on busy highways and bridges? The other day I saw somebody in the middle of a bridge changing a flat tire. Can you imagine that? Right in the middle of a bridge! Why on earth would anyone do that? As I passed the driver, dozens of questions rolled through my mind. When did he notice the flat? Didn't he notice it before getting on the bridge? Did he think something bad would happen if he waited until he reached the other side? Doesn't he realize he could get killed doing this? Do We Need MORE Traffic Cameras? I think we need more traffic cameras, as long as they're used in strategic places. We all hate traffic cameras... 99% of them are nothing more than traps designed to catch a driver who think's they can make it across an intersection before the yellow light turns red. Clearly their only motive is making money, but I would love to see this technology used for something far more important... catching JERKS who try to cut past traffic by driving on the shoulder. Sometimes car makers overlook simple problems. Don't you hate when you get into your car in the morning only to realize you left the window open the night before... and it just rained? Most cars today will warn you if you leave the headlights on, and they'll warn you if you leave the keys in the ignition... so why on earth don't they warn you when you leave a window open? Hey Car Makers... Shut the Lights! Who's fault is it when your battery dies because you left a light on? Most cars sound an alarm when you leave your headlights on by mistake, because it could drain your battery, but for some reason, there is no alarm when you leave an interior light on. Why is that? This little oversight is responsible for countless dead batteries over the years, but the solution is pretty simple. The easiest solution is to use electronic switches that automatically turn off 5 minutes after you turn them on, so they don't stay on all night. This eliminates the problem entirely because every light, including both interior and exterior lights will shut off long before draining the battery. Why aren't Dash Cams a BUILT-IN option on new cars? Just minutes after an accident takes place, the facts of the accident start changing. The driver in one car says one thing. The driver in the other car says something completely different, and passengers and witnesses all say something else. By the next day, each of those stories change even more. Don't you hate when you get into the car and the radio blasts way too loud? We've all done it before. You're in your car and one of your favorite songs come on, so you crank up the volume to the max. You shut off the car, close the door and head inside without realizing you forgot to lower the volume before you shut it off. Most states have a law that requires headlights to be turned on whenever you use your windshield wipers. I'm not questioning the law itself. When it's raining, visibility is low, so it's critical that every car have it's headlights on. That's not the point here. What I find interesting is that most cars still don't do this automatically. If a driver turns on his windshield wipers, but forgets to turn on his headlights, he not only risks the burden of getting a ticket, but he may cause an accident. While there may be some cars that do this automatically, the majority of cars produced today still don't do this, and they should. 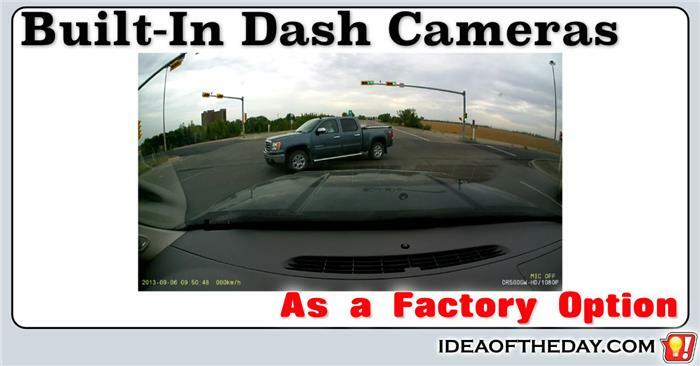 It's time car makers finally offer dash cameras as a factory option. It happens every day. A car travels down the road and reaches an intersection with a green light when suddenly another car crosses it's path. The result is a T-Bone collision where both cars sustain extensive and potentially life threatening injuries. It happens in a flash and within minutes the police arrive at the scene and ask both drivers what happened. Most of the time, the officer will get two totally different stories. One driver will claim that he had the right of way, the other will claim the opposite. Unless there are impartial witnesses on the scene, the officer is forced to split the blame 50-50... unless one of them has a dash cam. Why don't cars remind you when you leave the interior lights on? For drivers with kids, one of the most frustrating things is when the car won't start, because one of the kids left an interior light on. In an earlier idea, I talked about why Interior car lights should use momentary switches so you don't forget to turn them off, but if car makers don't do that, the least they can do is make sure the car warns you when one of the lights are left on. It's pretty strange that in this day and age, people still manage to drain their batteries because one of their lights were accidentally left on overnight. Why don't cars warn you when you leave your windows open? It's nice to know that most cars today have an alarm warning you when you leave your headlights on by mistake. That simple little alarm has saved quite a few batteries over the years. In fact I saved my battery just the other day. I got out of the car around dusk and forgot I even turned them on in the first place. That's the reason they created the option in the first place. They didn't realize they were on. For the same reason, car makers should do the same thing for windows. 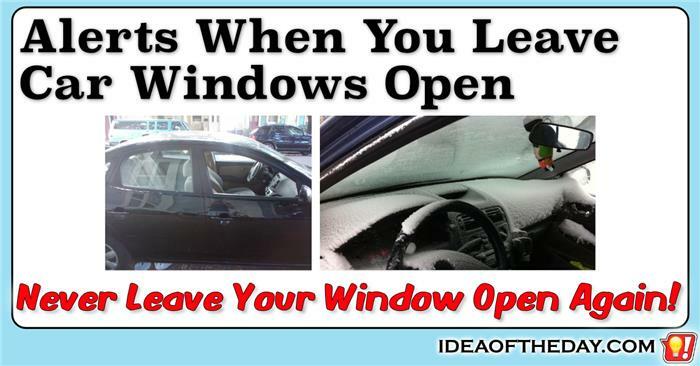 It's easy for people to forget they left one of the windows open, especially when they have 4 windows. When child sitting in the back seat opens a window, odds are the driver won't be able to see it. 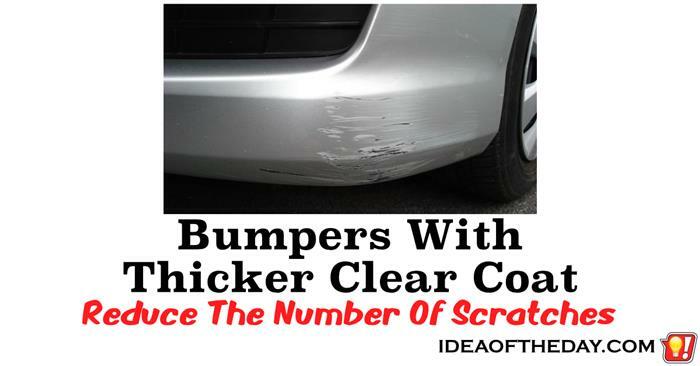 Why don't they use thicker coatings on car bumpers? In the old days, bumpers were made of chrome, and they had big rubber pads so scratches didn't show. Once car makers started using painted bumpers, they were mandated to have bumpers that didn't cost too much to fix for any accident under 5 miles per hour. The trouble is, they still get scratched, and for some people, that's a big deal. 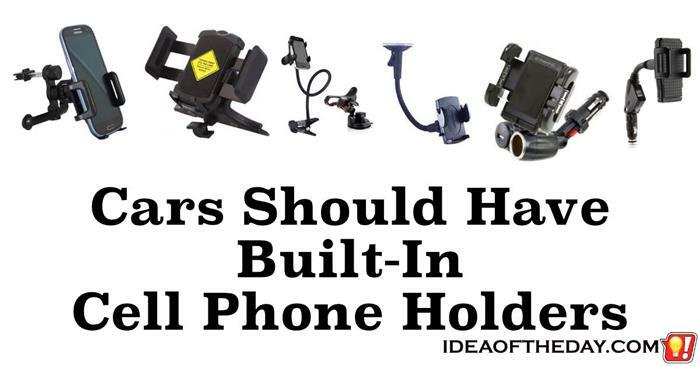 Why don't cars have a place for your phone? It took a long time for manufacturers to start making cup holders in car. Even after Drive Thru restaurants became popular in the 80s, there still weren't many cars that had cup holders. Some say the tipping point was when a woman sued McDonalds after a cup of hot coffee spilled on her lap. She didn't have a cup holder, so she just kept it where many people put their drinks back then... between her legs. What choice did she have? There wasn't anywhere else to put it. 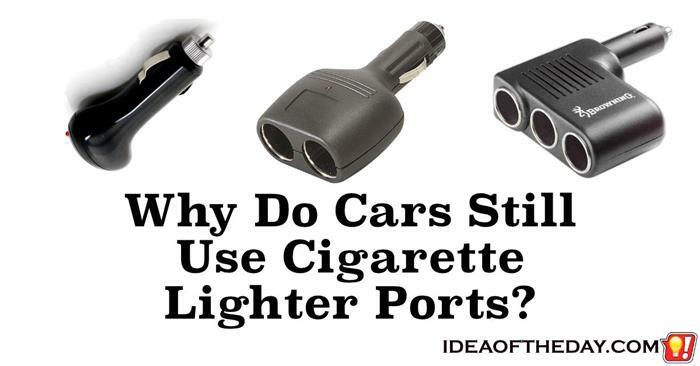 Why Do Cars Still Use Cigarette Lighter Ports? Cigarette lighter ports are just plain stupid. Isn't it strange that cars still have the same cigarette lighter ports as cars from the 50's had... even though they don't even come with actual cigarette lighters anymore? When you think of it, do you know of anyone who actually uses their 12V cigarette lighter for anything other than plugging in a 5V USB power adapter? So, why do they still use them? After all, cigarette lighter ports are not only bulky, but they're frequently unreliable, because the plug pops out. The original design was made specifically to accommodate the spring loaded cigarette lighter coil, and every plug that's been made since then uses some form of awkward spring loaded contraption that easily breaks or makes poor contact. Bumper cameras come in handy parking cars. Why not use them for evidence if somebody hits you from behind? Big Brother meets Big Bumper, always on the alert, just waiting for you to... Park the car? That's a lot of down time. Instead of simply turning the bumper / license plate cameras off when you are driving, why not turn them on whenever somebody gets too close while you're driving? This creates a perfect "Black Box" to prove beyond any doubt that somebody was driving too close... for too long. Idea for car makers... Add USB / Power ports ABOVE the mirror too. They always say "Necessity is the mother of invention". 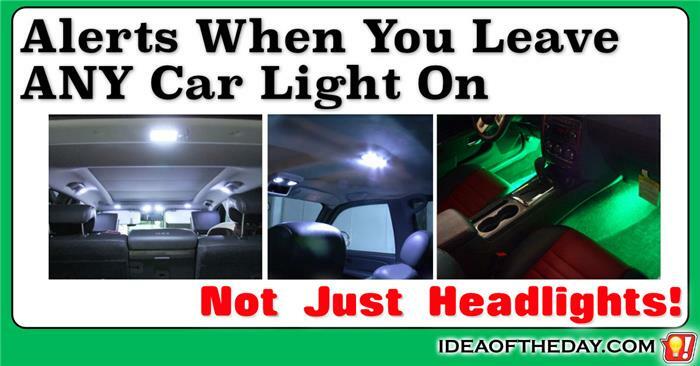 I need this, and it bugs me that car makers don't realize how useful this would be. A lot of us mount USB powered devices like cell phones and GPS units in our cars, but we tend to want to power them while we drive so they don't drain the battery. This means the stupid wires hang in front of our center console. 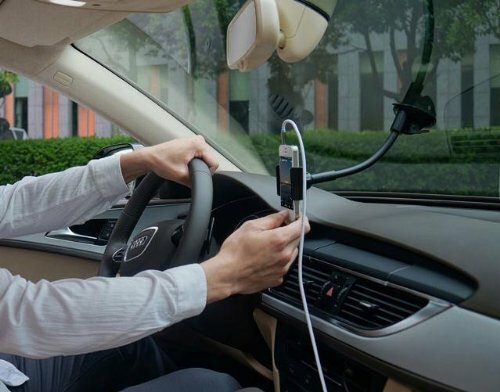 That's not only ugly, but it's a potential hazard if somebody knocks into the wire, and yanks the cell phone or GPS from the windshield. All it would take to avoid this is for car makers to put a couple of mini USB jacks above the mirror.